KRASNAYA POLYANA, Russia -- Maria Hoefl-Riesch won her second straight Olympic super-combined title Monday, and American Julia Mancuso won the bronze. Those problems left her in fifth place in the morning downhill, putting her more than one second behind Mancuso's inspired run. But the defending Olympic champion in slalom overcame the time difference in the afternoon and finished 0.40 seconds faster than silver medalist Nicole Hosp of Austria. 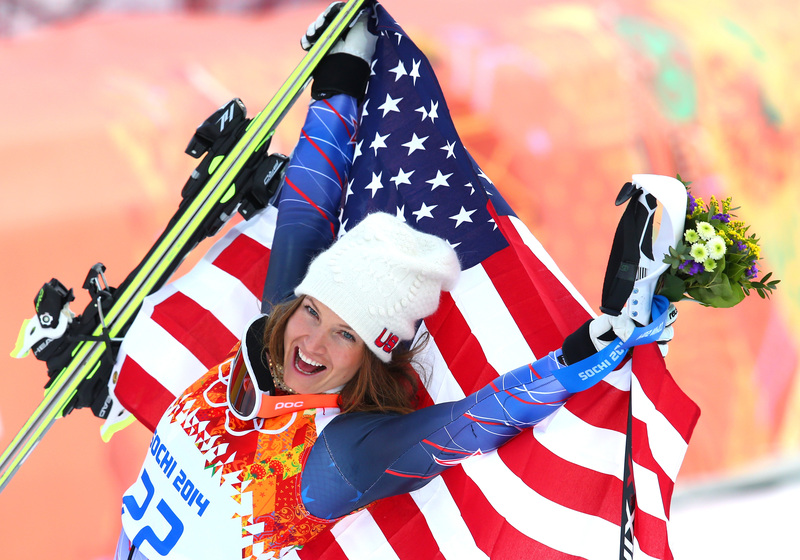 Now on the cusp of her 30th birthday, Mancuso told CBS News last month that at this point in her career, skiing is "99 percent mental" and she feels stronger and healthier than ever. "I'm definitely surprised that I'm sitting here now … and I'm doing the same thing I did as a kid – dreaming about the Olympics," she said, "I didn’t know I'd be doing it for so long and I still feel like a kid." Mancuso celebrated Monday's bronze more vigorously than Hoefl-Riesch toasted her own gold. Mancuso pumped a fist. She jumped in the air. She shimmied on the podium during the flower ceremony. "The first thing that went through my head is, 'See?! I CAN do it!' If you really believe, if you really, really believe, and if you're really, really positive, and if you just put it out there and go for it all the time, then good things will happen," Mancuso said. "And that was cool." ICE HOCKEY: The United States all but punched their ticket to the semi-finals of the women's ice hockey competition with a routine 9-0 triumph over Switzerland. Much as they did in their opening game against Finland, the second-ranked U.S. team dominated throughout and started to run away with it when two goals in an eight-second span of the first period made it 3-0. Hilary Knight, who scored less than a minute into the game against Finland, had a goal and an assist versus Switzerland. SHORT TRACK SPEEDSKATING: At the Olympic Park, Charles Hamelin of Canada raced to the 1,500-meter short track speedskating gold, and Viktor Ahn earned the bronze to give Russia its first-ever short track medal; Michel Mulder of the Netherlands earned the 500-meter speedskating gold; and Martin Fourcade won the 12.5-kilometer biathlon pursuit. At 29, Hamelin was the oldest skater in the first final of the short track competition. The wily veteran maintained a top-three position throughout most of the 14-lap race, leaving enough at the end to defeat a loaded field, including Ahn and silver medalist Han Tianyu of China. Ahn was a three-time gold medalist for his native South Korea, but after missing the Vancouver Games he changed his name and became a Russian citizen. When he stepped on the medals podium, the mostly Russian crowd erupted in wild cheers. SPEEDSKATING: Michel Mulder of the Netherlands earned the 500-meter speedskating gold. Mulder's 500-meter speedskating victory earned him the title of fastest man on skates. Teammate Jan Smeekens was 0.01 seconds behind for silver, and twin Ronald Mulder took bronze in a Dutch sweep. BIATHLON: Martin Fourcade won the 12.5-kilometer biathlon pursuit. Fourcade's win earned France its first medal. Ondrej Moravec of Czech Republic took the silver, and Jean Guillaume Beatrix of France earned bronze. Ole Einar Bjoerndalen of Norway finished fourth, missing out on a record 13th Winter Olympic medal. MOGULS: Canada's Alex Bilodeau defended his gold medal in Olympic men's moguls on Monday night, fending off rival Mikael Kingsbury to become the first freestyle skier to win consecutive Olympic titles. Bilodeau put together a perfect run in the finals to make history, posting a score of 26.31 on the slushy Rosa Khutor Extreme Park course in the medal round. Kingsbury endured a slight form break in the middle of his run and ended up with silver. Alexandr Smyshlyaev of Russia took bronze. CURLING: In a heavyweight matchup between two favorites for the women's curling gold medal, Sweden defeated Britain 6-4. Also, Canada routed 2010 bronze-medalist China 9-2 in a shortened game that was conceded because of the huge differential. Switzerland beat the United States 7-4 and Russia topped Denmark 6-4 in other first round-robin games.